Cyclamen plants are often referred to as shooting star plants due to their unusual appearance. The blossoms of cyclamen plants rise on stalks several inches above the foliage. The petals of the plant seem to grow backward and give the blossoms an appearance that resembles a shooting star. Cyclamen plants bloom during cool weather and are often available from florists from fall until spring. Put the cyclamen plant near a south facing window, out of direct sunlight. Cyclamen plants prefer bright, indirect sunlight. Place the cyclamen plant away from heating vents, as cyclamen plants prefer cooler temperatures. The ideal daytime temperature for a cyclamen plant is between 60 and 65 degrees F. The plant prefers nighttime temperatures near 50 degrees F. If a cyclamen plant is near a heating vent, the plant’s soil may dry too quickly. Insert your index finger into the soil of the plant up to the second joint. Water whenever the soil feels dry to the touch. Cyclamen plants prefer moist soil but will not tolerate soggy soil. To water, place the plant into a bowl filled with water for 30 minutes and allow the plant to absorb the liquid from below. Cyclamen plants grow from a tuber that can develop rot if you water the plant from above. Deadhead spent flowers by grasping the flower stem and pulling upward firmly to remove the entire stalk from the crown. Deadheading can encourage a cyclamen to develop new stalks and rebloom. A cyclamen bloom will last approximately four weeks. Keep they cyclamen's soil damp but not soggy once the plant goes dormant and leaves begin to fall away. Move the plant to a dark location and wait for it to slip out of dormancy again, which is usually in September. Then, move the plant into bright sunlight and water and fertilize monthly. Cyclamen blooms will typically be lighter in color and the leaf petoles will be elongated. For this reason, many people discard cyclamens after their first blooming cycle and purchase a new plant the following year. 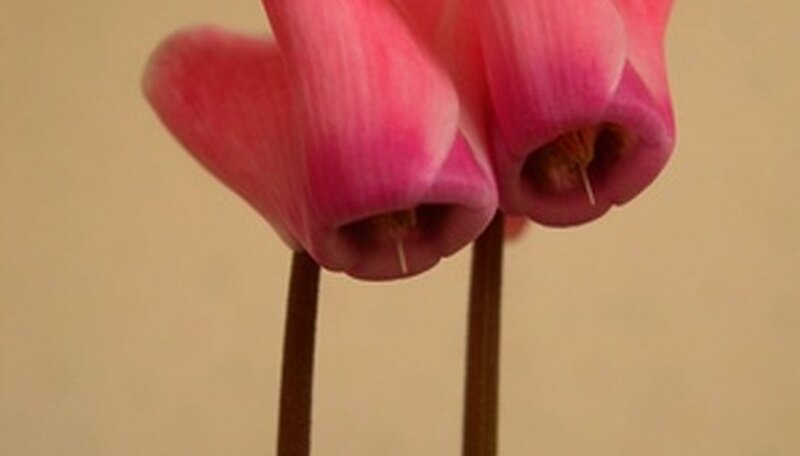 You can propagate your cyclamen plant by dividing the tuber once it naturally begins to separate, or by planting seeds. Both methods of division are difficult and erratic, according to Clemson University. This is why even experienced houseplant owners often purchase a new cyclamen plant yearly. Iowa State University Extension: What is the Proper Care of the Cyclamen?